Beaumont Council Approved Overcharging Area 7B $383,931.24 and What Happened to the 45 Pre-Payments? 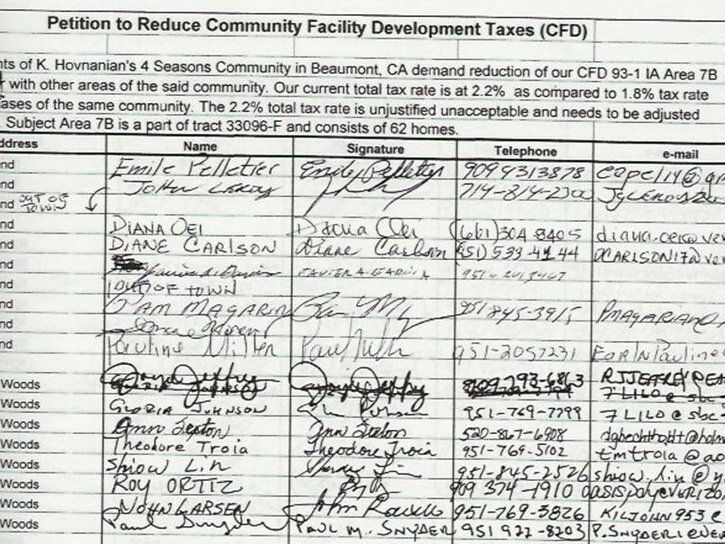 The Property Owners of the Senior Citizens Community of Four Seasons Area 7B have signed and presented a Petition to the City of Beaumont demanding that the City stop Illegally Overcharging Mello Roos CFD Taxes. And 7B Property Owners’ actions are more than justified. Area 7B had no Bond Debt until ‘Council Approved’ the 2009 Series A Bond for $1,725,000 issued on January 29, 2009. The 2009 A Bond states that there were 114 Private Property Owners in Area 7B that were not allowed to vote or even notified of the Bond acquisition. 2009A Bond Requisitions available state that $387,826.63 was transferred to the 2001 Wastewater Bond, which we know was then funneled to Urban Logic Consultants. And $515,489.27 was transferred to the City for ‘Summit School Acquisition’. Did it benefit the Senior Citizens in Area 7B to acquire the Summit School? No. No it did not. On May 23, 2012 ‘Council Approved’ the 2012 Series C Bond for $3,655,000. The 2012C bond states that there were 140 Private Property Owners at the time of the Bonds’ acquisition that should have been allowed to vote. And what was the excused used to funnel money out the 2012C Bond used for? Even if we ignore the illegality of acquiring bond debt without voter approval then misusing/embezzling all the money; Area 7B Property Owners are being charged over double the cost to pay off the 2012C Bond. The 2012 Series CD Bond pages 35-38 lists the Bond Premium and Interest Payment Schedules. The 2019 Premium and Interest Payments total $151,862.52. The City will charge Area 7B $442,742.04 in 2019, which is an Overcharge of $290,879.52. The City also will charge an additional $93,051.72 in CFD Services bringing the total of $383,931.24 in Overcharges to Area 7B Property Owners. Area 7B Property Owners have met with City Officials once and received ‘the brush off’. Area 7B Property Owners will meet again with City Officials at 2 p.m. on Thursday, August 16 at City Hall. 45 Property Owners pre-paid their CFD Taxes. The prepayments should have been submitted to the Bond Trustee to pay down the Principal, but was not. When asked for records of Property Owners’ prepayment money the City repeatedly states that there are no records. The City of Beaumont has built 20,000 houses and millions of square feet of warehouses without filing any legal CEQA EIRs. The Four Seasons Development Area encompasses 570.2 acres with over 2,450 houses. The only CEQA documents filed for the Four Seasons project was a Draft EIR in 1988 and a Notice of Determination in 2004. The Beaumont Basin is the City’s only natural water supply. The Basin has been in Overdraft for over 20 years and has only a 2-year Reserve remaining. State Law requires a 20-year secured water Reserve. Beaumont has refused to build fire stations or even provide fire protection to their citizens. Very few citizens reside within 4 minutes from fire and safety protection and some are over 20 minutes away. All fire services have been contracted from Riverside County since 2015. Beaumont Elected and Appointed Officials misused/embezzled $400 Million that should have been used to provide Infrastructure. The 2009 Series A Bond states that there were 114 Private Property Owners in Area 7B at the time the Bond was issued that were not notified nor allowed to vote. The 2012 Series C Bond states that there were 140 Private Property Owners in Area 7B at the time the Bond was issued that were not notified nor allowed to vote. 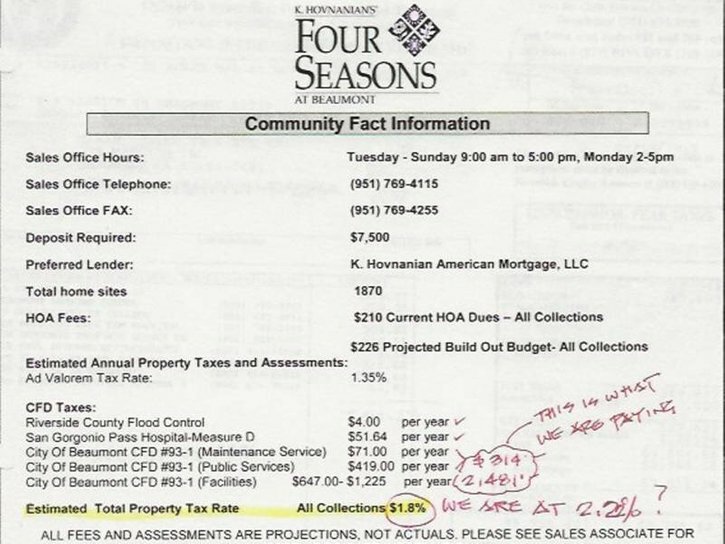 The flyer given to potential Four Seasons property owners states that all Property Taxes combined will be 1.8% of the homes’ value and the CFD Facility Taxes will range from $647.00 to $1,225.00. 2017 CFD Taxes for one property owner was $2,530.62 and is paying 2.2% of the property’s value. The list of 2017 Property Taxes for Area 7B created by Albert A. Webb and Associates and released by the City of Beaumont stated that the CFD Taxes for Area 7B would range from $1,682.00 to $2,480. The City of Beaumont charges every CFD Property Owner an additional $350/year for ‘CFD Services’. While it is true that Mello Roos laws do provide for a services charge to operate the CFD facilities; the service charge is only for additional services need for the facilities, not basic services. Cali Govt Code 53313: A community facilities district tax approved by vote of the landowners of the district may only finance the services authorized in this section to the extent that they are in addition to those provided in the territory of the district before the district was created. The additional services shall not supplant services already available within that territory when the district was created. This isn’t how any of this works. Bond debt is divided equally among the property owners – it’s not based on the size of the houses. Period. Four Seasons Area 7B is a Senior Citizens Community. 2009 A Bond Requisitions list over $500,000 was used for ‘Summit School Acquisition’. Cali Constitution Sec. 6 (4) No fee or charge may be imposed for a service unless that service is actually used by, or immediately available to, the owner of the property in question. Fees or charges based on potential or future use of a service are not permitted. Standby charges, whether characterized as charges or assessments, shall be classified as assessments and shall not be imposed without compliance with Section 4.